Last night when the Minnesota Vikings took the field against the New York Giants, they did so without their star QB, Brett Favre. The “Iron Man” stood on the sidelines with a sprain to his SC joint after starting a staggering 297 consecutive games in his 19 year career. After the game, Favre had this to say about the end of one of the greatest streaks in all of sports. "Relief, in one sense. There wasn't a whole lot of pressure on me today. It's been a long time. I'd much rather be playing; that's just my nature. I don't want to say it was time, but it's probably been long overdue. There's probably been a lot of times the streak should have ended." Favre will undergo another examination today on his sprained SC joint, which he believes has made the numbness in his right hand a lot worse. Have we finally seen the last of Favre with only 3 regular season games remaining? After the game, Farve said, “I won't play again if I can't feel my hand. I think it would be foolish to even consider playing if you don't have total feeling in five fingers." 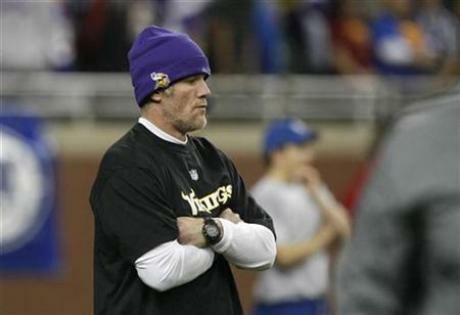 This has no doubt been a disappointing year for Favre and the Vikings…and perhaps the collapse of the Metrodome roof this past Sunday sums up the Vikings season and the “Iron Man’s” final year. Although I’ve been a fan of Brett Favre for many years due to the simple fact that he plays with a fire and passion that you don’t see in many athletes anymore, I now can say that I wish ol’ #4 had stayed in Mississippi this year. It’s been a great run and you could argue that Favre is the best QB of all time, but every great story has to end at some point, and I believe the time has finally come to roll the credits. You haters can say what you want about Favre, but the game will forever be changed when “The End” finally comes in the great story of Brett “Iron Man” Favre.